Recently, within a week or two a brand-new very clear and very controversial Bigfoot photograph has been released on the Internet by Melissa Hovey. According to Melissa, she received the Bigfoot photo roughly 4 years ago and kept it private for the most part until recently when she officially released it on her website. Allegedly, the Bigfoot photo was sent to her and another researcher by e-mail from an individual who is looking to protect the Bigfoot species. 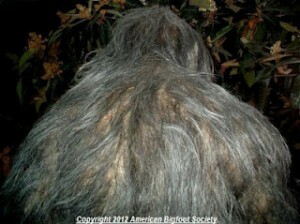 The second Bigfoot researcher has dismissed the photo, however Melissa believes the photo could be authentic. Melissa was asked why she finally released the photo after four years and she indicated she was hoping to have some type of dialogue with the original sender, have him come out of hiding and to protect other Bigfoot researchers from a potential hoax. Originally the sender claimed to have more photographs and would release them, however, backed out in fear of being labeled crazy. According to Melissa however she has reestablished contact with the sender after she released the photo to the public; hopefully now he will release more photographs to Melissa for further investigation. The photograph has now been viewed by various special effects experts such as Bill Munns, among others. Bill Munns has stated he thinks it’s a fake, while other special-effects experts have stated if it is a fake, it’s a very expensive fake, according to Melissa. Melissa was told that if it is in fact a gorilla/bigfoot suit, it would be very expensive upwards to $100,000. Personally speaking, just because the possible Bigfoot suit appears very expensive does not preclude it from being a hoax. Quite frankly, if people are saying it could be a suit but it would be very expensive and highly unlikely; to me that would indicate chances are it’s probably a well-made Bigfoot costume. Right now there are lots of rumors and things being said on the Internet about the picture and the American Bigfoot Society. I don’t think Melissa is part of any hoax herself; however I think she’s being duped by this individual for fun, boredom or for various other reasons. As you can probably tell, I believe the photo is fake for a lot of reasons, but quite simply just looking at it doesn’t look like organic material to me. I won’t go into details on why I think the photo is bogus but there are many good Bigfoot researchers on various blogs and forums who are very good and logical analyzing the photo. If you have any thoughts on the photo itself, please leave a comment below. I would love to read about other people’s opinion on the authenticity of the photograph. While I’m not convinced that this is a real photo, I agree that the hair looks synthetic, I don’t agree that “lack of motion blur” should be a reason to discount this or any other picture of Bigfoot these days. Even cell phones can take clear pictures of a moving target with little to no motion blur now. I believe this is a fake photo of a bigfoot, but not a hoax either. I think it’s a picture of an actual werewolf costume that has been used in a film. Look closely at the right ear. It looks to be pointed, which is typical for a werewolf costume used in movie productions. With the availability of photographs over the Internet, anyone can upload them and pass them off as “real bigfoot” photos. It’s so obvious that Melissa was duped on this, or the photographer would have released a face or profile shot if he indeed has more photos.